I found this beautiful sole at the market yesterday, and though they were shipped in from the Netherlands. The fish monger explained to me and the dubious signora next to me that most of the sole in Europe comes from the Netherlands, and that most of the sole found in the seas around Italy are tiny, weighing up to 40 grams. These bitty soles are generally fed to children because there aren’t any tiny bones that they could choke on. When my husband was a baby his mother would boil these baby sole and mash them into a pulp to assure that his bones would be strong when he grew up. I’ve had sole a number of times in the Netherlands and there it is generally fried in butter, which is delicious, but since butter is considered too heavy by most Southern Italians, I decided to use olive oil. I’m really not into frying my food, I like to leave that to my mother-in-law and to restaurants, but my husband convinced me that I needed to use practically half the bottle of olive oil as opposed to a few tablespoons. I think that after three days in Naples, the reign of fried food seeped into my blood. To contrast our fried fish and keep it a somewhat light dinner after our gluttonous weekend in Naples, I accompanied the sole with a mache and pear salad. Mache, which I discovered here, is called either valeriana or songino in Italian. 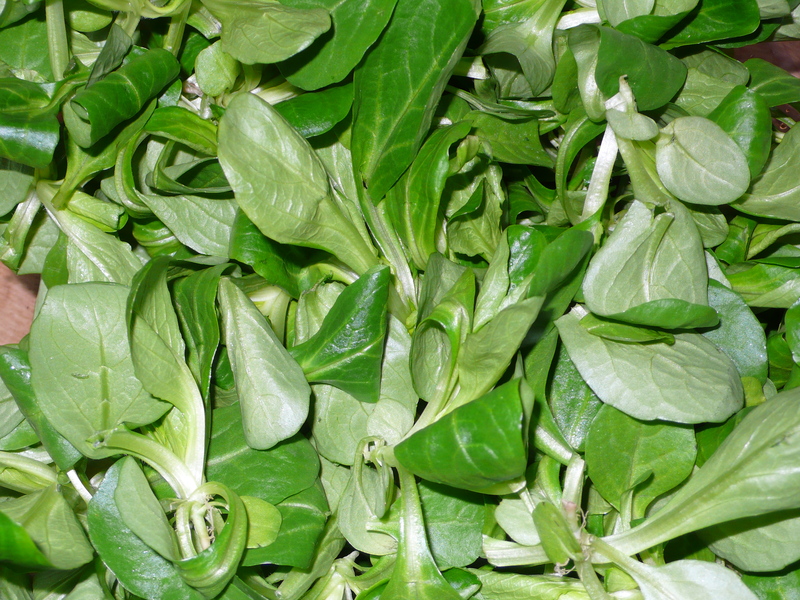 I love this little green it is so delicate and goes well with fruit and with a dressing that is a little bit sweeter. My husband had been in Pisa at his uncle’s house that afternoon and brought us some honey that his uncle’s bees had made, which obviously went in the dressing for this salad. I’d never had honey that tasted this good, I could eat it by the spoonfuls. 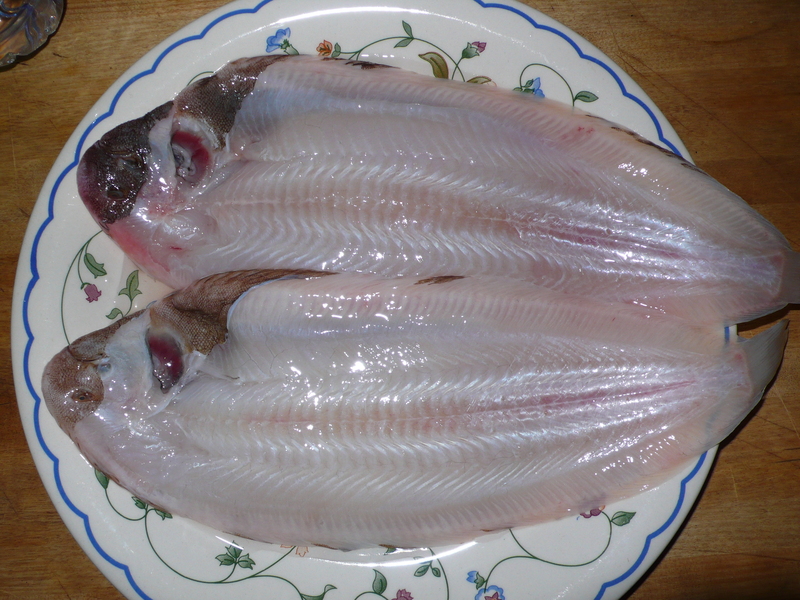 You should ask your fish monger to skin the sole for you when you buy it. I‘m sure that they can be fried with the skins on, but it makes it harder to clean. Heat olive oil in a wide deep frying pan on medium-high heat for a few minutes. You want the oil hot but not smoking. Test the oil with a piece of bread to see if it sizzles, I stupidly used water which popped and sprayed everywhere, but it told me what I needed to know. While waiting for the oil to heat up rinse the sole in cold water and pat dry. 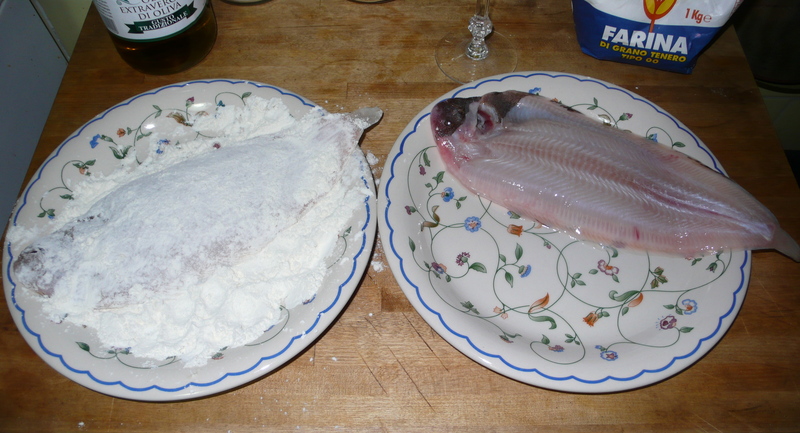 Dredge the fish in the flour, covering it completely and place it in the hot oil, being careful not to burn yourself. You should be able to put both fish in the pan together. Turn the fish after about 3 or 4 minutes, it should be a golden brown at that point. 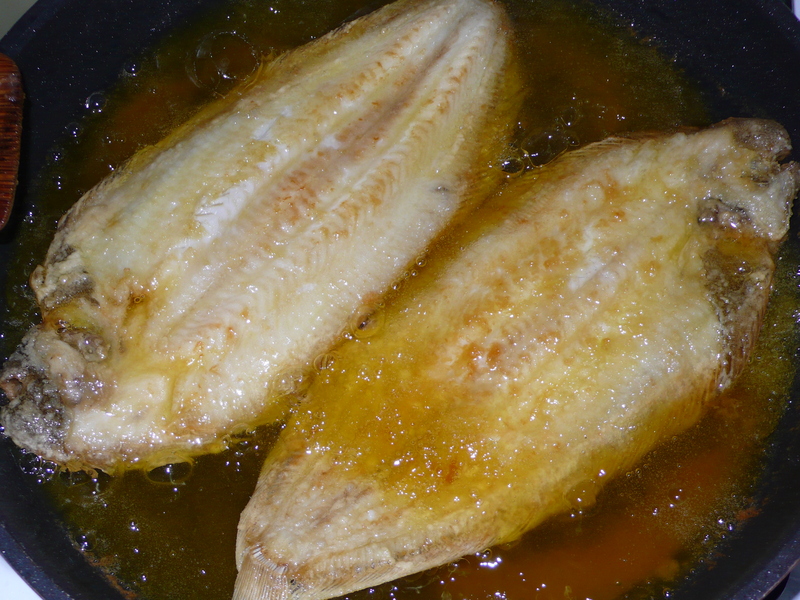 Fry it on the other side for another 3 or 4 minutes and your fish should be ready. Check to see if it is opaque. Just like the ricciola, my husband cleaned the fish, though from what I have understood they are the easiest fish to clean. I recommend cleaning them as you eat them, you want to eat fried fish hot and if you clean them beforehand they’ll get cold. If needed, wash the mache and dry it. Toast pine nuts in a small skillet over medium-low heat until they are browned, turning every now and again. My mother taught me how to make salad dressing and always makes it at the bottom of the salad bowl adding all of the ingredients and then mixing it together with a fork. I do the exact same thing. 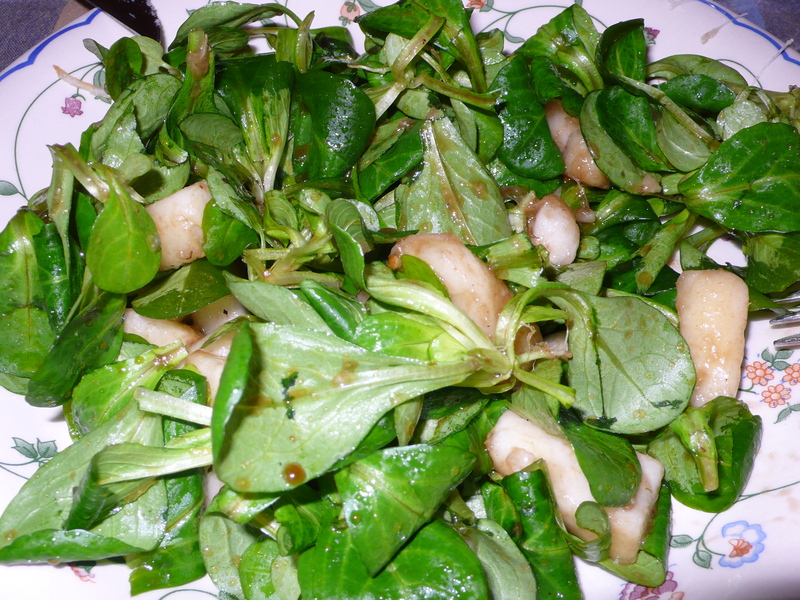 Italians mainly dress their salads with oil, vinegar or lemon and a pinch of salt. Slice pears, throw everything together and toss the salad right before eating it. Vinegar tends to cook the mache if it is left for too long. ~ by italicious on October 22, 2008.